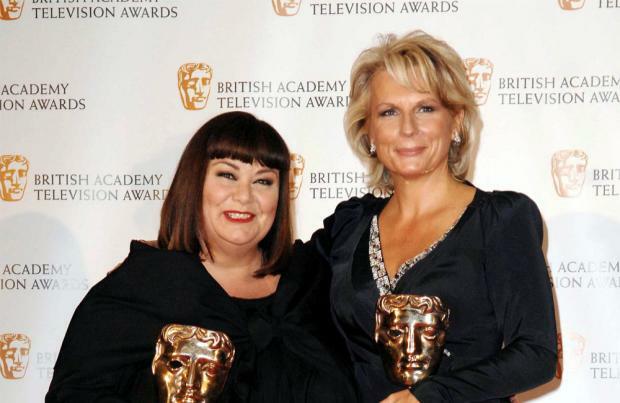 Jennifer Saunders and Dawn French have repeatedly asked for a cameo in 'EastEnders' - but their requests have been turned down every time. The 'French and Saunders' stars have been inundated with requests to make some celebrity appearances since the 59-year-old actress announced she was making a film of the hit series 'Absolutely Fabulous' in 2015, but the one show they want to nab a role in aren't interested in them because bosses believe they will be "too obvious." Speaking to The Sun newspaper, Jennifer said: "I love 'EastEnders'. Me and Dawn say to them: 'Put us in the back of the shot - we could just wander through the Queen Vic. But they always go: 'You'd be so bloody obvious.' I don't think they trust us." However, even if they did manage to secure a part, Dawn, 60, is too busy at the moment as ITV have asked her to return as the host of 'Little Big Shots', which sees four to 13 year olds take to the stage to show off their skills, after the first instalment received such rave reviews when it hit screens in March this year. Dawn said: "I absolutely loved filming the first series and cannot wait to get started on the second. It's the show where I get to hang out with incredibly talented children from all over the world, making new friends on the sofa each week. I will never forget Balang from the Philippines, who had me in fits of giggles while teaching me a move or two, or Thomas who sang David Bowie's 'Space Oddity' so beautifully! In our crazy upside down world, it is great to make a show that is just so positive." Series one saw talented youngsters from classical music masters and a miniature chef to an ace ventriloquist and a marvellous magician take to the stage, as well as tiny dancers, pop sensations, an audacious scooter stunt kid and a spelling bee specialist. However, bosses are hoping the new series will allow them to spread further afield in order to find amazing, talented children bursting with enthusiasm.